Since the introduction of industrial agricultural practices in South African sugar cane production, soil compaction has led to a steady decrease in average yield and profitability. Dr Rianto van Antwerpen, a senior scientist at the SA Sugarcane Research Institute, advises farmers on how to care for their soil to avoid this problem. Dr Rianto van Antwerpen says that since the introduction of industrial farming practices, sugar cane yields in South Africa have gradually declined as a result of little or no organic matter being put back into the soil. 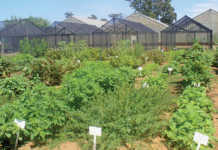 Soil is critical for human survival. The International Union of Soil Sciences recently declared 2015 to 2024 the international decade of soil to encourage people to rehabilitate degraded soils. Productive soils should be sustainably utilised, so that sufficient food and fibre can be produced for a growing global population. Sugar cane is as major food crop, with formal sugar industries established in about 120 countries. According to the SA Sugar Association, South Africa’s sugar sector generates approximately R14 billion a year, and contributes 0,6% to GDP. The industry supports around one million people. Ever since South Africa’s sugar industry adopted industrial agricultural practices, soil compaction has become a major problem that affects yield, sustainability and profitability. Dr Rianto van Antwerpen, senior scientist at the South African Sugarcane Research Institute (SASRI), provides a possible solution. “Before World War II, organics were the major source of nutrients for sugar cane farmers around the world, including South Africa,” he says. to farm more efficiently. The demand for efficient sugar cane production resulted in the use of fire as a means to burn unwanted residue from sugar cane crops just before harvesting”. Heavy machinery was also increasingly used for planting, fertilising, spraying, harvesting and hauling. While this industrial-type farming worked well for several decades, the global sugar cane yield gradually began to decline. According to Van Antwerpen, soil compaction caused by heavy machinery traffic over a sugar cane field is reversible, but heavy machinery damage caused to sugar cane stools is not. Stools that have suffered minimal damage will always produce sub-optimal yield for the remaining ratoons, and severely damaged stools will need to be eradicated and damaged rows replanted with fresh seed cane. Regardless of the severity of damage caused to the cane stools, the farmer will lose out financially; replanting a sugar cane plantation currently costs between R20 000/ha and R25 000/ ha. 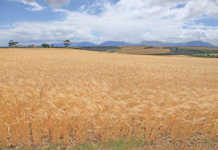 Unfortunately, the wheel-spacing of the heavy machinery commonly used in South Africa’s cane fields is at least 1,8m, which exceeds the commonly used 1,5m inter-row spacing between plants. While machinery drivers try to avoid damaging the cane stools, the wheel-spacing of their vehicles often results in the wheels along one side of the vehicle driving in the inter-row spacing between plants, while the wheels on the opposite side continuously drive over the sugar cane rows. Thus, one set of wheels causes reversible soil compaction while the other causes stool damage. Furthermore, as each subsequent ratoon grows out slightly into the inter-row spacing, it becomes increasingly difficult for drivers to avoid damaging sugar cane rows. “It also doesn’t help if you have a tractor where both sets of wheels fit into the inter-rows on either side of sugar cane rows, but the wheels of the trailer behind the tractor are riding along one or more sugar cane rows,” Van Antwerpen points out. Farmers who use machinery with a wheel-spacing of 1,9m should use an inter-row spacing of at least 1,7m to prevent either set of wheels driving over the sugar cane rows, according to him. However, the widening of inter-row spacing will mean fewer metres/ha of cane stools, resulting in decreased yield and income. 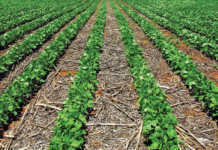 For example, a 1,5m inter-row spacing will produce 6 667m/ ha of stool, but a 1,7m inter-row spacing will produce only 5 882m/ha of stool, resulting in a loss of 785m/ha. 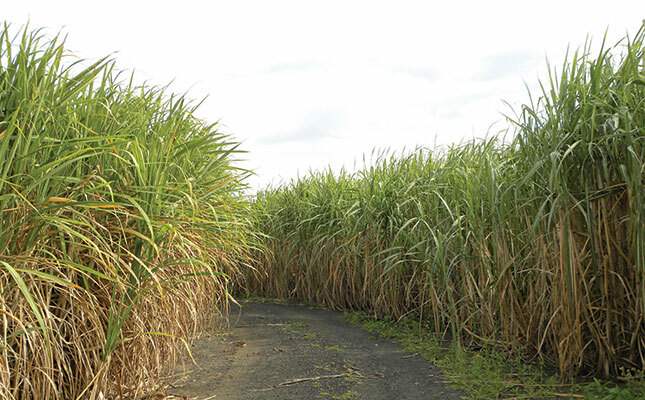 Research conducted by Van Antwerpen and his colleague, Peter Tweddle, reveals that the only way to avoid reducing the metres/ha of stool while minimising the damage caused by machinery, is to grow sugar cane in the dual row configuration and control vehicular traffic in the plantation. “For a vehicle with 1,9m wheel-spacing, we found that planting two rows of sugar cane only 0,6m apart, and then having a 1,2m inter-row spacing on either side before the next two rows of sugar cane were planted, was an efficient configuration. This means that for the crop’s lifespan, which averages between seven ratoons and 10 ratoons, the machinery will always travel in the inter-rows without damaging the sugar cane rows. 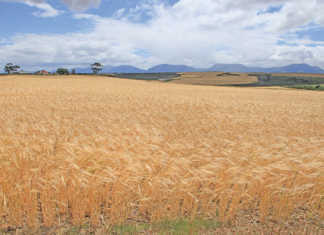 Moreover, the overall length of rows is increased to 11 111m/ ha,” Van Antwerpen says. The ideal machine for loading cut sugar cane onto a haulage vehicle in-field is a loader with slewing ability. The wheels of the loader will remain in the inter-rows, and the operator can slew the machine’s grab attachment to access the cut sugar cane before loading it onto the haulage vehicle without damaging the stools. One way to minimise inter-row soil compaction is to fit heavy machinery with high-flotation tyres, or use multi-axle trailers. While trailers fitted with double wheels per axle are an option, the width of the track may be too wide, thereby causing stool damage. For this reason, single wheels per axle should be used. As damage to sugar cane rows can cost a farmer a great deal of money in replanting and added expenses, it is prudent to invest in machinery with appropriate wheel spacing and align inter-row spacing to accommodate the machinery, Van Antwerpen stresses. While a number of factors contribute to declining sugar cane yield after harvesting consecutive ratoons, farmers who reduce stool damage from in-field traffic can sustain higher yield by adding more economically viable ratoons from a single sugar cane planting. This could generate added income for the business, and help recover the expenses of new, better machinery. South Africa’s sugar industry stakeholders recommend that 10% of a sugar cane farm be replanted every year in a continuous rotation. If a farmer adheres to this principle, it will take him 10 years to fully convert a field layout to incorporate permanent lanes for in-field machinery and align wheel-spacing with inter-row spacing. After converting to this system and thereby reducing stool damage, one dryland sugar cane farmer was able to increase his average yield from 108t/ha to 127,5t/ha, for an improvement of 19,5t/ha. “Machinery traffic cannot be eliminated from a sugar cane field. However, the impact of this machinery can be effectively managed. With appropriate wheel spacing, stool spacing and inter-row spacing, only the inter-rows will be subject to compaction, and the stools will not be damaged,” says Van Antwerpen. Phone Dr Rianto van Antwerpen on 031 508 7400, or email him at Rianto.vanan[email protected]. This presentation was given at the No-Till Club’s 2016 Conservation Agriculture Conference.